The new 2014 Ford Fiesta is truly a global car that gets some of the most extreme testing on the planet. An automobile doesn’t become a global car by just looking stylish. Unless it’s undergone some severe testing it can’t handle the world’s extremes. Ford subjected the new 2014 Fiesta in Europe to the most extreme testing over harsh terrain, extreme temperatures, and a lifetime of simulated use. The new Ford Fiesta testing took the compact car through extremes from tortuous durability trials to exhaustive ‘real-world’ challenges. The tests extended over more than a half million miles on test tracks and in laboratory conditions ranging from -40 to 180 degrees and engineers evaluated the Fiesta’s performance over 745,000 miles on public roads. A global car needs to be prepared for the most extreme use and global conditions to ensure it excels in day-to-day performance over the life of the vehicle. “A combination of high-tech laboratory simulations, demanding test-track trials and real-world evaluations helps us deliver a durable Ford Fiesta that owners can be confident will survive the worst they can throw at it throughout its lifetime,” said Glen Goold, new Fiesta global chief program engineer, Ford of Europe. Ford engineers subjected the new compact car to extreme tests at Ford’s Lommel Proving Ground in Belgium, France and the U.S. They also have an exact recreation of a potholed stretch of road near the Ford Dunton Technical Centre, England. The grueling tests simulated the worst-case conditions that customers could encounter and included a variety of artificially constructed obstacles designed to place controlled loads on components to simulated a lifetime of abuse in just months or even weeks. The new 2014 Fiesta was developed in North America and introduced to Europe in 2010. The 2013 Fiesta has been one of the top selling cars in Europe and the new model will be even better. Ford recruited 100 drivers of all ages and sizes to conduct the tests in 115 new Fiestas. The driver’s tested everything from the seats to the accuracy of the “distance to empty” indicator by running the car out of gas. Ford leaves no stone unturned, and makes sure the car is ready to handle the global challenges it will face. “By paying this level of detailed attention to every aspect of the car we can make a real difference to the overall driving and ownership experience of new Fiesta.” said Thomas Schlimbach, senior engineer, Voice of Customer Fleet program, Ford of Europe. 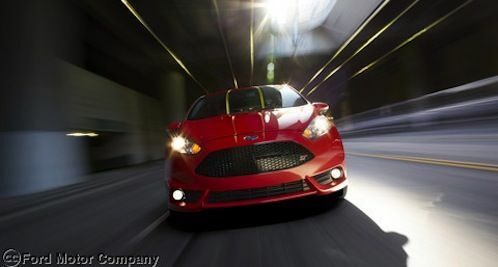 Look for the all-new 2014 Ford Fiesta to launch next year. It sounds like the global car is just about ready for the world’s most extreme conditions and consumers.